Last week, I had the privilege to speak at and attend Workhuman. It is a remarkable event hosted by the visionary people of Globoforce. I feel privileged to have been a part of it this year. This is the first of a few posts inspired by the event. There are far more people talking about human workplaces today than there were even a few years ago. But most of that conversation tends to focus on the positive, affirming, self-actualizing side of being human. We focus on helping employees feel more authentic, happy, healthy and engaged at work. But as my wife reminded me after last year’s event, this is only one side of the human story. Where is the conversation about the struggles of life? What about the very human experiences of trauma and grief? What about issues of fear and safety? We’ve witnessed over the past year what happens within organizations when you ignore or aren’t equipped to navigate these things. Uber, Weinstein, and many others come to mind. It can have disastrous consequences. People get hurt. Making work human means embracing and understanding the good and the bad. If your organization is all yin and no yang, you don’t have a human workplace. That doesn’t mean you have a bad workplace, but you are out of balance. And it’s likely that you are losing out on a lot of potential contribution and creativity from your people. Workhuman this year brought a beautiful balance of yin and yang to the conversation. The big solo keynotes all addressed this balance in their own way. Brené Brown reminded us of how there can be no courage or joy without vulnerability. And that we can (and must) learn to be more vulnerable. Simon Sinek explained how many organizations fail because they adopt a finite approach (beat the competition) while not understanding that they are playing an infinite game with no finish line. Losing in business isn’t about finishing second, it’s about quitting because you lack the will or resources to continue. Shawn Achor, a happiness researcher, spoke of how we can unleash potential by finding sustained happiness through connection with others. Even he, the happiness guy, spoke of his own struggles with isolation-fueled depression (ironically while teaching and researching happiness) and how he found his way back to happiness through connection with others. In addition to these solo keynotes (which would have been an A+ lineup for most conferences), they tackled some really important issues that we must understand and confront if we want our workplaces to be good for all humans. Salma Hayek was interviewed on stage to close day one and talked about her personal journey and struggles as a female Mexican immigrant as she accomplished so many incredible things. She spoke very frankly about how walls were thrown up in front of her over and over again, many a product of systemic bias and discrimination that we have yet to truly address in society and within our own organizations. 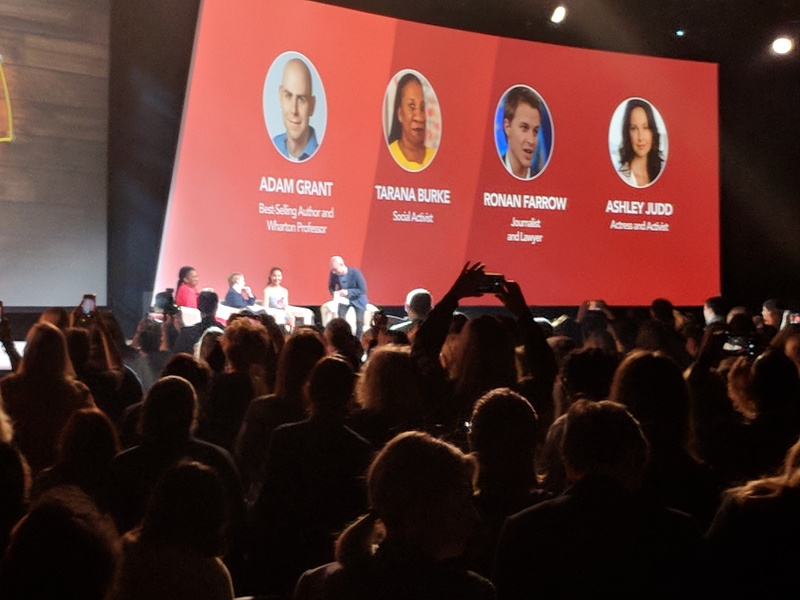 The pinnacle moment of the event was the #metoo panel that featured Tarana Burke, Ronan Farrow, and Ashley Judd (moderated masterfully by Adam Grant). They tackled in an unflinching way the issues we are all trying to come to terms with around sexual harassment and sexual violence, inequity, and abuse of power within our workplaces and beyond. They called out how we need to be hyper-vigilant to not let this conversation get hijacked or diverted to things that it’s not about (i.e. “People are afraid to give hugs in the office now…”). The panel was moving, motivating, and informative. There is really important work to be done to create true equity and safety in our workplaces. There is a wind at our backs. Now is the time, and we all have a role to play. All of this, complemented by the breakout sessions, really leaned into and addressed the spectrum of human issues it takes to create a human workplace. It achieved a yin-yang balance that I’ve never experienced at any event in the past. The experience was a great reminder that we have to be very intentional to find the yin and yang. It’s not good enough to put in a great employee engagement initiative if you aren’t willing to address the leaders who are creating an unsafe or inequitable work environment. A human workplace requires that we find the courage to tackle all of these issues, even when they are profoundly hard and uncomfortable to face. It also requires that the yin and yang balance exist at the employee level. You can’t expect an employee to bring and contribute their very best every day without making room for the other, less productive stuff to come along. When we are scared or hurting or we feel unsafe, we can’t perform our best. A human workplace has mechanisms to meet you where you are, provide the support you need, and then unleash you to make your best possible contribution that day. Hopefully, I’ll see you at Workhuman next year. Mark your calendar for March 18-21, 2019 and set aside some budget dollars now.